Ted Talbot says that he thought at one time that this view was a little further north than the photo of a 17in Coal engine in a cutting (which seems to be north of Lichfield), which is slightly further north than the photo of the Dreadnought coming the other way. Is anyone able to provide a date and any other details please? I cannot identify the location but the date is most probably 1924, but possibly 1925 (we can guess a summer Saturday), with the loco and a couple of new carriages in LMS livery, the majority of the carriages still in LNWR livery. For a 1925 date I would have expected some of the LNWR carriages to have been repainted. According to Baxter no. 6978 (formerly LNWR no. 1638) received its LMS red livery and new number in 1/24 and is obviously clean. In spite of the heavy load it is blowing off, suggesting mastery of its task. First carriage is a high roof double-ended (former slip) brake composite, still retaining the birdcage lookouts which were all removed by 1927. Second is a cove-roof double-ended brake composite. These were typically employed as through carriages to destinations such as Pwllheli and Aberystwyth. 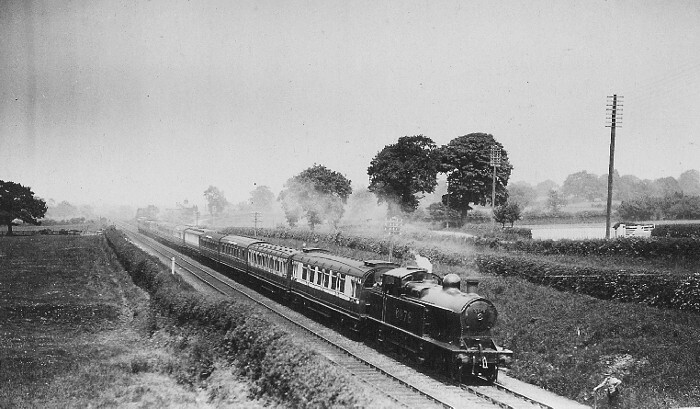 Then follows two rather new LMS corridor coaches with roofboards, and then an LNWR 8ft 6in wide dining saloon. After that the photo is indistinct, but may well be a four-coach Inter-Corridor Set, again with roofboards. So we are looking at a principal express, perhaps a relief, with portions for several ultimate destinations. My print of this photo, which came from the collection of the late Geoff Platt, has pencilled on the back "near Wem". Which side, and facing which direction, I don't know. I love Philip Millard's reasoned argument; and totally concurr. But as to location, I find myself saying that it does not look like the Main Line. The countryside could be Cheshire, my home county. And the clean loco might be ex-works; but a tank engine? And the multi-portioned train? So perhaps a running-in turn from Crewe Works, where the LMS portion of the journey is quite short? How about Crewe to Whitchurch then, where the GWR would take over? Or all the way to Shrewsbury; which would make it a North & West Express? In O.S.Nock's book, The Premier Line, first published in 1952, there is a log of just such a run with one of the 4-6-2 tanks, pps 211 & 212. Usually though, when I suggest anywhere, it is the "kiss of death", and it turns out to be completely the other end of the LNWR system! Congratulations to all on excellent detective and team work, which supports what is written on the back of my print: "Near Wem, 13.8.24. W.H.W." In other words, W. H. Whitworth took the picture and the information came from him. The only problem is that Glyn Williams and I have been to Wem and examined the view from every over-bridge, both 'near' and 'far' from Wem station, and have been unable to identify the exact location. So then we came up with the idea that 6978 would next pass under the over bridge in the distance in Mystery 72 which is a little to the north of Mystery 70. One reason for thinking this is that there is a road with tall telegraph poles running parallel to the railway in all three pictures. Mike Williams clearly supports my thoughts. Now Wem is just outside Cheshire, in Shropshire, and my late mother lived at Wem for some years. Clearly the train is heading south, in the summer, late morning. A long straight with raised ground to the east, points to the location being south of Yorton. And so the train would indeed be a southbound north & west train, heading for Shrewsbury and the G.W.R. I don't know the area well, but from the map the most likely location "near Wem" on the Crewe to Shrewsbury line seems to be about two & a half miles south of Wem station, and about a mile north of Yorton. There's a road overbridge near Holbrook Hall, and the road then continues north next to the railway on its east side for about 450 yards before bending off to the east, at a house between the railway and the road. If the photographer was standing on or beside the bridge, the visible details all seem to fit, and the train would be heading south. The train would appear to be the 11.40am from Liverpool LS/11.50am from Manchester LR, 1.12pm from Crewe, arr. Shrewsbury 1.55pm, conveying portions Liverpool - Aberwystwyth, Liverpool - Bristol, Manchester - Bristol and Manchester - Cardiff. GWR and LMS stock worked round on these services on alternate days. Looking at the photo again, the sixth coach (and the subsequent three?) appear to be GWR, so may well be the Cardiff portion. No. 6978 was allocated to Longsight in 1927 - if it was there in 1924 also then that is another clue. If this is where I think it is, going up the 1 in 208 a mile north of Yorton, the sun would be about due south, and so about midday, so I'd suggest an earlier train than the 1.10pm ex-Crewe. The October 1921 and July 1922 timetables (the closest years I have) both show an 11.42am from Crewe, non-stop to Shrewsbury, arrival at 12.27pm. There's a legend alongside: "Luncheon, Tea, & Dining Car, Liverpool to Plymouth" with a departure from Liverpool at 10.35am and arrival at Plymouth 7.38pm. If this train was still running a couple of years later, could this be it? I am sure that Harry Jack is correct with his identification of both location and train. I have marshalling information only for 1921 and 1927, but in 1927 the relevant train was the 10.30 from Liverpool LS, 10.40 from Manchester LR. These were complicated trains with many through carriages, extensively remarshalled at Crewe. Also different formations on MWF and TThS. From Crewe, the formation was BCK Liverpool - Pembroke Dock, BCK Liverpool - Swansea, then two GWR carriages BTK and CK Liverpool - Plymouth (here they are LMS vehicles), one 65ft 6in Dining Saloon and one GWR BTK carriage Liverpool - Plymouth, then two LMS carriages CK and BTK Manchester - Cardiff, then a GWR BTK Manchester-Kingswear. The formation in the photo corresponds closely with this. Apropos Ted Talbot's post, August 13th 1924 was a Wednesday.